To all our members, sponsors, partners, ambassadors, guides and volunteers. Welcome to the November edition of the Achilles NZ newsletter. This event held in late October and incorporates those participants in the 12km, the half marathon and the marathon going over the Auckland Harbour bridge was rather special this year as for the first time, wheel chairs were allowed to compete and race in the marathon. It was a hugely successful trial with 20 wheelchair athletes including two from Australia enjoying the opportunity to compete in one of New Zealand’s important running events. Our thanks goes to many who made this possible but special thanks goes to Peter Loft and Brennan Loft for all their work in making this happen before, during and after the event. We do hope this now becomes an annual occurrence where more and more wheelies compete. Pictured above is the wheelchair events Start. Achilles NZ wishes to thanks Cigna and especially Leah and Naomie for their organisation and the opportunity for five athletes and their guides to compete in the Cigna sponsored Queenstown 10km on Saturday November 17. The weather gods were kind enough to keep the snow away (which hit Monday). Pictured above are our finishers Susan, Gareth, Michelle, Lisa, Shannon, Vicki, Dave and Josh. We wish all the best to Ryan one of Achilles Board members who unfortunately snapped his achilles tendon just recently. We wish him a speedy and healthy recovery. The Board will be meeting in December for a strategic review of the last six months and also to look forward to the next six months. Twelve Achilles NZ athletes along with their guides competed, finished with the majority achieving personal bests in the New York City Marathon of 2018. The weather gods were kind and gave all the 50,000 participants ideal marathon weather-sunny, no wind and cool conditions. Although not much inspiration was needed those that were lucky enough to meet two NZ legends and winners of the New York marathon Rod Dixon (one of our Ambassadors) and Allison Roe (inducted in the NY marathon hall of fame for 2018) were certainly encouraged by their words of wisdom. As per usual and keeping the streak alive, all our athletes finished so the famous black body bags of Peter Loft were not needed!! Our thanks to all our guides, supporters, family members and Marathon Tours to make this event an amazing running/walking/wheelchair experience! Finish line picture of Keryn Lowry, Peter Loft, Brennan Loft, Marianne and Rebecca. What is your disability? I’m legally blind. I was Born with it, degenerating over the years, losing any usable vision around 11 years ago. Most proud Running achievement? There’s been many but probably Tauranga Ironman 70.3 in 2014 where I smashed it out in 5h 36 min. Favourite event? Have to say Wellington’s off road 62k ultra, WUU-2k. But, generally love to swim so it’s any triathlon. Hobbies/interests? Guitar, learning Te Reo Maori, my two sons and of course the outdoors, whether its water or mountains. Favourite food? I enjoy a tasty Chilli con Karne, chocolate and purple Jet Planes. What do I love most about running with Achilles? A few Laughs whilst learning about new and interesting things via a korero with a like- minded guide on a long, preferably off- road run. Favorite quote? Just because I can’t see the stars doesn’t mean I can’t reach for them. Dave with his Guide, Josh. What Event did you last Guide/Volunteer at? Queenstown Tenner with Dave Piper. Why did you become a Volunteer/Guide for Achilles NZ? To assist the inspiring Achilles athletes’, achieve their goals! What are you Hobbies/Interests? When not running… swimming, cycling, kayaking and wakeboarding. What is your Favorite food? I am an Avocado Aficionado! What do you love most about being involved with Achilles NZ? The people involved are all so inspiring and friendly with contagious can-do attitudes that keep me coming back for more! If you could invite any four people to Dinner who would they be and why? Beauden Barrett because I love rugby and he is an impeccable specimen! Hilz Bazz (Hilary Barry) and Jeremy Wells because they are both great New Zealanders with even better chat! Annnd William Waiirua because Wowwweee! Achilles NZ would also like to mention that Dave and Josh are on the start line 8 Feb next year for the 2 Day Individual category of Coast to Coast. Dave and Josh will be biking a tandem around 135km over three stages, paddling a Tandem kayak 67km down the Waimakariri River and he will have two guides for the 33km Mountain Run where they will be joined by well respected Achilles Guide, Olivier Lacoua. 1 serve of PURE Blackcurrant Recovery powder. Combine the frozen banana and blueberries in a food processor or blender. Pulse until the fruit are well chopped. Add the spinach and PURE Whey Protein Organic Vanilla or PURE Blackcurrant Recovery powder to the ingredients and process until well incorporated. Join team Achilles International New Zealand for the 55th Rotorua Marathon. Depending on the distance you pick, you will enjoy a route through Government Gardens, through the Redwoods of Whakarewarewa forest, over the sulphur flats, or following the original marathon path around Lake Rotorua. As an Achilles International New Zealand Athlete or Guide, use the pin code “ACH19” when you register to receive 10% off your entry fee. PLUS register before 30 November to take advantage of early-bird pricing for an extra discount. We'll give you fundraising tips, along with the best training support we can to get you over the finish line. You will also receive special discounts! One of the highlights of the evening amongst so many was our very own Achilles Children’s Ambassador Jaden Movold winning the Attitude Youth Spirit Award. It is not often that our Jaden is lost for words but after his initial shock and silence Jaden gave a heart- felt speech in accepting his award. So, congratulations Jaden on winning this award and all the great work you do in the community. We want to thank Cigna for the opportunity of attending this event and we all came away inspired by all the amazing stories and accomplishments of those living with a disability in business, art, leadership, sport just to name a few!! You can watch the TVNZ special of the Attitude Awards on TVNZ 1, Sunday 2 December, 11.00am and on demand at www.attitudelive.com and www.tvnz.co.nz shortly thereafter. At ACC, we’re proud to be Principal Sponsor of the Attitude Awards. For more inspiring stories from around the country, make sure to follow Attitude on Facebook. 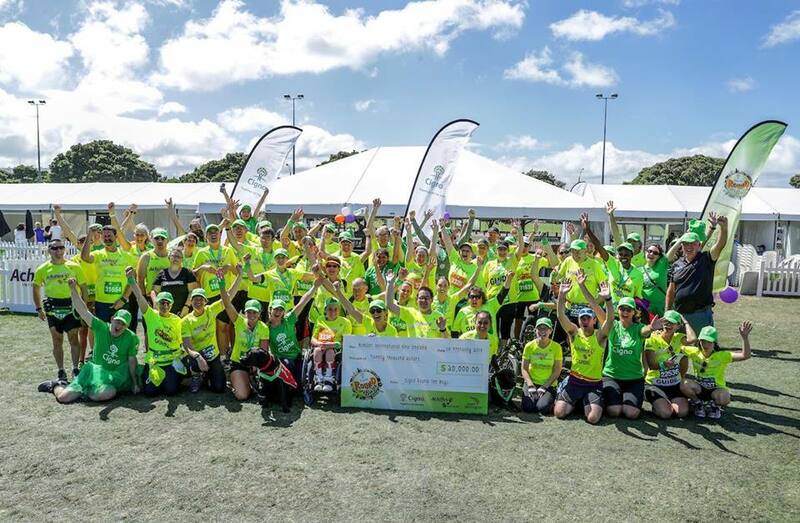 The Brendan Foot Supersite Round the Bays in February, which includes Cigna staff and Achilles involvement will be held on Sunday February 17 2019 in Wellington. Can you all save this date and begin to make preparations to attend and train. It is indeed one of the highlights on our Achilles NZ event calendar and we certainly want to exceed the numbers of last year so we are looking at least to have 80 plus athletes and guides descending on Wellington in February of next year. More information will be made to our Chapter leaders and members in early December but start thinking about booking airfares to get the best deals, as the package made available to those wishing to attend will be similar that was offered for this year’s event. Please contact your Chapter leaders for further details. Do have a great month in December whether you are going to race or just train or attend the various Parkruns around the country. Do keep up all the great work in training and being part of this worldwide Achilles family.